The Field Spaniel breed evolved about 150 years ago, and was developed in the English countryside. The Field is a very old breed, first known as the Black Spaniel or Land Spaniel, but is now predominantly liver (brown) in colour, arising from crossing the Sussex Spaniel and after World War II with the English Springer Spaniel. Field Spaniels can quite easily live to 13 years of age, but with lots of care and the right nutrition given in its diet they will often live up to 15 years of age. In peak trim these dogs should weigh 16kg and be 40cm tall for the females and 23kg and 46cm in height for the males. This is a breed for the energetic! They are active, tireless and inquisitive and can be noisy and if not fully occupied can be destructive. The Field Spaniel is a loving and sensitive breed that adores being with people and involved in all the household activity. The Field Spaniel requires firm and consistent training. They enjoy travelling and car rides. The Field Spaniel will enjoy other pets for company as they love to play all day. They should be familiarised with other household pets at an early age. 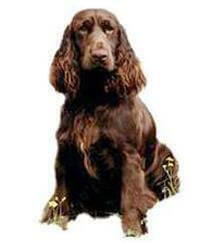 One of the largest of the Spaniels, the Field Spaniel needs quality feeding at regular hours. The Field Spaniel is easy to maintain, with the removal of excess hair from under the ear, around the feet and from the hocks is all that is required to keep the dog smart and neat, the coat requires just a daily brush to keep it healthy. The Field Spaniel is an active dog and tireless worker. Their docile, affectionate and friendly nature makes it an excellent companion and family dog. However, it is very much a working spaniel and, as such does require daily exercise and patience.